I want to share something odd with you. I don’t think you will mind, since I have already made myself quite naked here. About a month after the life changing summer, I was out for a walk. I am a walker — it is one of the ways I solve my problems, foot to earth, step by step. It is the same way with writing, pen to paper, word by word. As I rounded the corner to turn down the hill of my street, I noticed the sun setting over the horizon and I stopped to admire its beauty. It was glowing a gorgeous fiery orange hue and seemed to be floating in a cloud of pink dust. For some reason, I turned around and right behind me was one of the largest moons I have ever seen, also a beautiful orange color, having just risen over the Eastern horizon. It was as though I was in the middle of a fulcrum with these celestial bodies perfectly balanced on opposite ends of the earth. In all my years of living here, I had never experienced anything quite this magical. I stood there awestruck for a few moments and then it happened, the odd part I mentioned earlier. I heard the words, plain as day: trust and surrender. I turned to see if anyone was around, but there was no one. I returned to the beauty before and behind me, and heard them again, loud and clear, just as the sun sunk below the edge of the world and the moon crept upward to take its place in the night sky. Trust. Surrender. At that moment, those words were hard to comprehend. Surrender? Trust? I trusted no one and surrendering seemed impossible. To whom? To what? I stood there and waited for more but nothing came. At first, surrender smacked of giving up, but I soon discovered that it is really more about yielding. If you have ever been caught in a rip current, you know the feeling of fighting against something beyond your control. 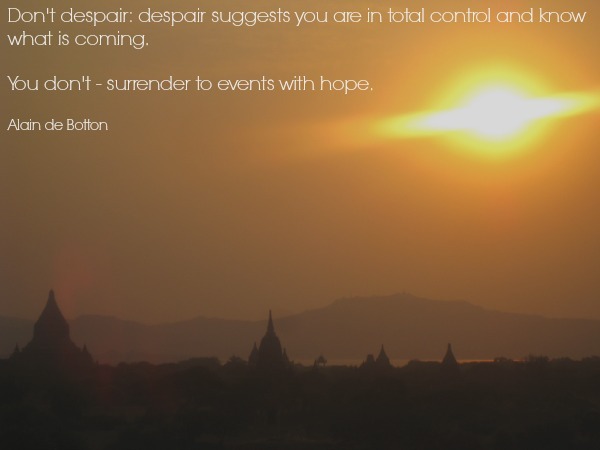 The wisest (and scariest) thing to do: surrender to the power of the current. The force will carry you to the end of its tenacious fury, and while you might be beat up, the energy of surrender is far less taxing than energy spent in a futile battle with the ocean. On my subsequent walks, I let the words roll around in my brain and pondered their possible meaning in my world. I heard them again and again, and eventually, they found their way into the compartment I had placed around my heart and soul, wrenching the space open for another way of being. It was the beginning of a relationship with a deeper part of myself that seemed to know things well beyond the physical world in front of me. Embracing the concept of trust in the midst of this crisis seemed counter-intuitive. I wanted to think my way through the damn thing, not get tangled up in some notion of touchy, feely trust. But I kept hearing the word and the more I allowed myself to feel into my heart and trust the answers there, the more I discovered a flow. Trust called in a calm energy of strength that allowed me to respond from a place of knowing, rather than react from fear. What I found while knee deep in trying to make sense of why this word had appeared is this: trust creates intimacy and really, when you think about it, isn’t intimacy what our soul craves — the sacred union with our deepest self that holds the truest reflection of who we really are? If we can’t be intimate and honest with ourselves, how can we ever turn outward to another human? As the months went by, I continued to walk. I inwardly waved my white flag of surrender and it began to dawn on me that my soul wanted to be known, by me, and the only way for that to happen was through trusting myself. All this from standing between the sun and the moon one evening, bathed in the orange glow. Do you trust yourself enough to surrender to the mystery of your circumstances and let your soul shine through? What does your soul crave? That was a beautiful scene you described and clear ocean situation. Thank you for the direction. Hard question to answer. Step by step I guess. I am so stubborn even with myself. found you thru twitter…..absolutely loved this. the trusting yourself stuff….i think that matters so much. thank you for the most beautiful reminder!